Our main research technique to understand their ecology is photographic identification (photo-ID). Through citizen science contributions in 2015, and initial satellite tracking of whale sharks from Tubbataha Reefs Natural Park in the Sulu Sea in partnership with Tubbataha Management Office (TMO) and Palawan Council for Sustainable Development (PCSD), we identified the presence of whale sharks in Honda Bay, just north of Puerto Princesa City, the capital of the province of Palawan. 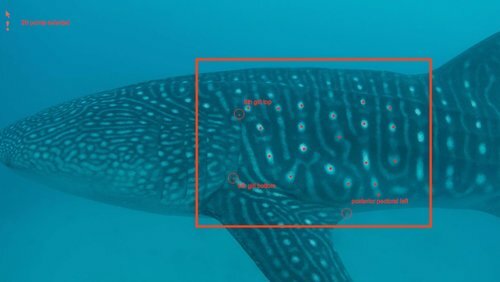 In 2016 LAMAVE had a dedicated effort to further assess the feasibility of whale shark data collection, and this was further validated in 2017. We have now identified over 50 individual whale sharks in Honda Bay and have satellite-tracking data for a few individuals. In order to further understand the ecology of whale sharks using this rich shallow ecosystem, we will conduct season-wide surveys employing photo-ID, focal follows, and satellite data, to understand their seasonality and habitat use. LAMAVE will be working closely with the local government unit of Puerto Princesa, under whose jurisdiction Honda Bay is, and the Palawan Council for Sustainable Development, under whose management the whale shark and its habitats fall. Data and results will be shared with these stakeholders, as well as with coastal communities with whom whale shark-fisheries interactions occur, with the overarching goal of regulating the wildlife watching tourism industry that is currently underdeveloped in Palawan. Our team will employ successful techniques we’ve used in Southern Leyte, Donsol and northern Mindanao.